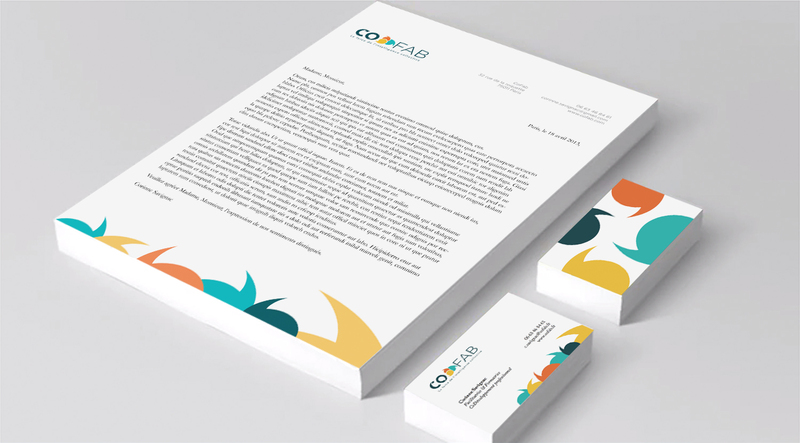 Project objective: to design a logo for CoFab (a professional codevelopment firm) that would be serious with a strong human component. CoFab promotes exchange between peers and aims at recreating a healthy social fabric through its facilitated sessions. After I did my preliminary research on the industry and the competition, I decided to create a logo based on dialogue and communication between people. Negative spaces within the letters C and O have the shape of quotation marks which are well known symbols of verbal communication. I used a positive version of the same shape again to create bubbles as another symbol of verbal communication. The three bubbles are entangled to represent collective intelligence and suggest that the global exchange in a group is greater than the sum of the individual contributions. The colour palette proposes fresh, vivid and innovative hues while being serious and reliable thanks to the dark blue. I then used the look and feel of the logo to create stationary.